For those with the budget to afford it, the Precor TRM 835 is one of the best treadmills on the market today. Part of the company's Experience Series, this is a powerful, durable, commercial-grade machine that delivers performance like no other. 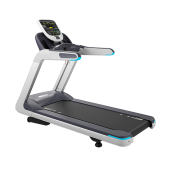 The TRM 835 is gray and black with sky blue accents, with a large LED console showing 20 workout metrics such as speed, calories, heart rate, incline/decline, pace, watts, time and more. UPDATE: As of Summer 2017, it looks like they have already pulled this new treadmill from the lineup for some reason. Check our Precor treadmill reviews for a comparable model. Reviews on the Precor TRM 835 are very positive, as they are on the other Experience Series model, the TRM 811. If you can swing the high price tag (just over $8700) you'd be hard pressed to find a better treadmill on the market. You get a new shock absorption system called Ground Effects Impact Control which gives you solid support and minimizes damaging effects on your knees and joints. You have Integrated Footplant Technology which gives you a more natural stride. The multi-ply deck is reversible, pre-maxed and virtually maintenance free. The frame on the TRM 835 is solid and stable, giving you that commercial gym feel. You get 25 workout programs to choose from, including heart rate, weight loss, fitness tests, interval training and more. It is a nice step up from the mid-range TRM 445 model, with a larger deck, higher speed range and decline capability up to -3% in addition to the 15% incline. 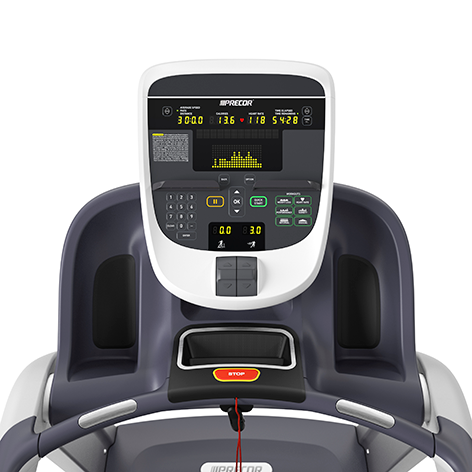 As far as feel, design and construction, the TRM 835 is at the head of the class, and users really appreciate all of the technology that goes into these treadmills. Anything missing? It would be nice to have Preva workout tracking like on other machines, and perhaps a standard touch screen display for that price. It is optional, but we feel they should include it for the almost $9000 price tag. The Precor TRM 835 is an incredible treadmill, ideal for users of all fitness levels. 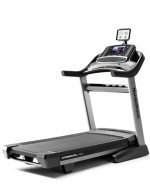 It can accommodate light workouts all the way up to marathon training with its large runner's deck, incline and decline, advanced cushioning, wide range of workout programs and speeds up to 16 mph. If you can afford it, you'll get years of enjoyment out of it, with little to no maintenance required. You'll likely be a little happier with the optional console, but the standard treadmill has enough features and capabilities to keep you satisfied. If you want to save a little money, take a look at the TRM 811 as well. You don't get decline, and you'll have fewer built-in workouts, but otherwise it's quite similar and about $1000+ less.